The Nokia Lumia 900 is already out in the States, out in Canada, and it’s soon coming to Europe as well. Its first stop - the United Kingdom on April 27th. The UK is getting the white version of the 4.3-inch Nokia Windows Phone and you can pre-order yours now. The Lumia 900 will initially be offered on Carphone Warehouse and Phones4U. It seems like Nokia has picked a good time frame for the launch of the Lumia 900 save for the fact that in the States, day one of sales coincided with Easter, so most AT&T stores were closed. Except for that, though, the handset is coming in a time where there aren’t that many high-profile new handsets out there. The upcoming Samsung Galaxy S III seems to be months away, and the new iPhone is expected somewhere in the third quarter of the year. 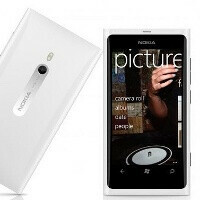 In Canada, the Lumia 900 is offered on a 3-year contract, a standard in the country, but in the States and the UK the subsidized option will be made available on a 2-year agreement.